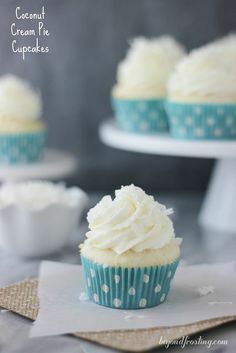 These Coconut Cream Pie Cupcakes are the perfect combination of coconut cake with a lightly sweetened coconut mousse and topped with a cream cheese whipped cream. Pre-heat over to 350� F. Mix Coconut milk well before adding to batter. In a large mixing bowl, combine cake mix, shredded coconut, egg whites, coconut milk, vegetable oil, sour cream, coconut extract and baking powder. Beat on medium speed until all ingredients are well mixed. Scrape down the sides of the bowl and stir from the bottom. Visit Coconut Cream Pie Cupcakes @ beyondfrosting.com for full instructions.